The industry-standard Cisco® Small Form-factor Pluggable (SFP) Gigabit Interface Converter is a hot-swappable input/output device that plugs into a Gigabit Ethernet port or slot, linking the port with the network (Figure 1). SFPs can be used and interchanged on a wide variety of Cisco Systems® products and can be intermixed in combinations of 1000BASE-SX, 1000BASE-LX/LH, 1000BASE-ZX, or 1000BASE-BX10-D/U on a port-by-port basis. The 1000BASE-SX SFP, compatible with the IEEE 802.3z 1000BASE-SX standard, operates on 50 ?m multimode fiber links up to 550 m and on 62.5 ?m FDDI-grade multimode fibers up to 220m. 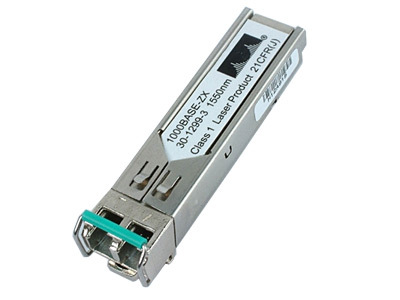 The 1000BASE-ZX SFP operates on standard single-mode fiber-optic link spans of up to approximately 70 km in length. The SFP provides an optical link budget of 23 dB, but the precise link span length depends on multiple factors such as fiber quality, number of splices, and connectors. When shorter distances of single-mode fiber are used, it may be necessary to insert an inline optical attenuator in the link to avoid overloading the receiver. A 10-dB inline optical attenuator should be inserted between the fiber-optic cable plant and the receiving port on the SFP at each end of the link whenever the fiber-optic cable span loss is less than 8 dB. The 1000BASE-BX-D and 1000BASE-BX-U SFPs, compatible with the IEEE 802.3ah 1000BASE-BX10-D and 1000BASE-BX10-U standards, operate on a single strand of standard single-mode fiber. A 1000BASE-BX10-D device is always connected to a 1000BASE-BX10-U device with a single strand of standard single-mode fiber with an operating transmission range up to 10 km. The communication over a single strand of fiber is achieved by separating the transmission wavelength of the two devices as depicted in Figure 2: 1000BASE-BX10-D transmits a 1490 nm channel and receives a 1310 nm signal, whereas 1000BASE-BX10-U transmits at a 1310 nm wavelength and receives a 1490 nm signal. Note in Figure 2 the presence of a wavelength-division multiplexing (WDM) splitter integrated into the SFP to split the 1310 nm 1490 nm light paths. The GLC-BX-D and GLC-BX-U SFPs also support digital optical monitoring (DOM) functions according to the industry-standard SFF-8724 Multi Source Agreement (MSA). This feature gives the end user the ability to monitor real-time parameters of the SFP, such as optical output power, optical input power, temperature, laser bias current, and transceiver supply voltage. The Cisco SFPs are supported across a variety of Cisco switches, routers, and optical transport devices. For more details refer to the document SFP Compatibility Matrix. Note: Only connections with patch cords with PC or UPC connectors are supported. Patch cords with APC connectors are not supported. Note: Patch Cables need to be compliant with GR326. * A mode-conditioning patch cord, as specified by the IEEE standard, is required regardless of the span length. Note how the mode conditioning patch cord for 62.5 ?m fibers has a different specification from the mode-conditioning patch cord for 50 ?m fibers. Table 3 gives electrical parameters and Table 4 gives temperature range and DOM support information for the SFPs.